A kind of ‘Dr. Strangelove: How I Learned To Stop Worrying And Love The Bomb’ – but for real, The Hurt Locker is basically about a military explosives expert in Baghdad who gets a huge rush out of his job, and he’s not kidding. 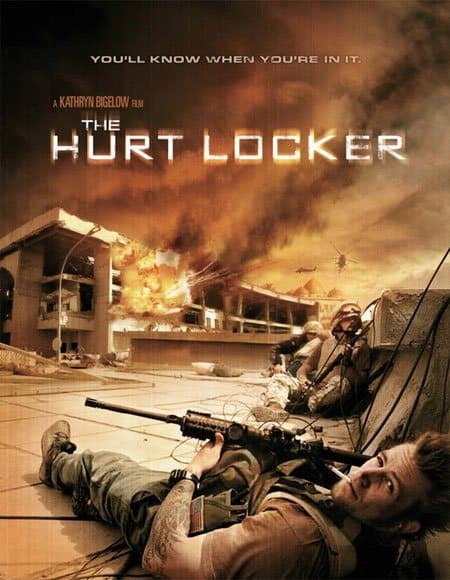 Which is to say that The Hurt Locker and its war is fun mantra – move over videogames and those second hand vicarious thrills a minute – is just about as irresponsible as can be. This combo macho glee and military mechanics grating reality show style thriller crafted with icy precision and little else, is written by Mark Boal, a news reporter who spent time embedded in tanks with the US army in Iraq. And it shows. Claustrophobic in the extreme both politically and physically even when prowling the wide open spaces of the Iraqi desert, The Hurt Locker dismally lacks any point of view. Other than to imply that the Iraqi population ranges primarily from predators to ingrates, and without so much as even a hunch as to why we’re there or what the locals may resent about that. Which is to say that the story could just as well be taking place in a cops and robbers inner city venue, or right out of a classic western. And the fact that this war movie is directed by a woman, Kathryn Bigelow – and one with impressive unusual creds for making gritty, testosterone fueled films about men (Point Break, Strange Days, The Widowmaker) that delve into the raw male psyche at that, is inconsequential. Bigelow disappoints here, as a director for hire simply following rules in a man’s game. Never mind that a substantial number of female soldiers are part of these bomb detection crews, there’s not a military woman in sight. The hurt locker in question is a souvenir box of Iraqi bomb making material that Sgt. William James (Jeremy Renner) hides under his bed between adrenaline quick fix danger junkie outings either dismantling explosives or killing people. And the other men in the Bravo Company alternate between jealousy and admiration for this mysterious guy, who doesn’t let a trifling matter like dying himself at any moment, ruin his day. The Hurt Locker: War is never having to say you’re sorry.